In fact, the ‘Consciousness-Force’ or ‘Chit-Shakti’ poise of Reality invests every level of the creation with meaning and purpose. But one question remains unanswered. If Existence has a meaning and purpose, if life has an aim and a goal, if evolution follows a progressive curve, if growth implies a movement from the Inconscience to Superconscience, then why do we have so much waste in nature? There is a waste of energy, a waste of resources, a waste of the intellect, a waste of life, a waste of time and finally a waste of the Divine Grace! There is a ‘waste’ at every level of creation, at every plane of consciousness, in terrestrial as well as in individual life. Consider the terrestrial existence. At the physical plane, we have the great natural calamities—the earthquakes, volcanoes, famines, tornados and tsunamis. We also have man-made disasters, accidents and mishaps that grow in proportion with our gadgets and inventions. At the vital plane, we have the great wars, the internecine conflicts, the ethnic clashes, and the mismatch of civilizations. Besides there is the subculture of crime and the parallel kingdom of the mafia. At the mental plane, we have the great conflict of ideologies, the imposition of the whims and fancies of one set of people over another. What a colossal waste of resources! That is how the self-styled representatives of humanity could sentence Jesus to be crucified! The phenomenon of waste is also explicit in individual life beset with diseases, old age, desires, passions, egoistic yearnings, dogmatic and stereotyped thinking. Behind everything is the huge waste of time. Imagine how many millions of years nature had to waste to perfect the intricacies of physical beauty –the design on a butterfly’s wings, the delicacy of the rose petals, the colour of the flamingo! How many millions of years had to be spent to make our earth a fit habitation for supporting life! How many millions of years were needed to evolve the human being! Finally, there is the colossal waste of the immense bounty of Divine Grace that is bestowed on the earth despite the insincerity, the ingratitude, the revolt and the treachery of human beings. What is the significance of all this waste in Existence? In fact, Sri Aurobindo clarifies that an objection based on the limitations of the human intellect cannot be generalized for the universal operations of the World- Force (The Life Divine, pg. 98). The fact that all possibilities have an equal chance of manifesting gives equal weightage to the ‘waste’ and ‘productive’ elements of existence. If a person is trained to be an excellent cashier, he can also develop into an excellent thief! The wife of the person who ‘invented’ the hypodermic syringe (that saves lives) was the first recorded subject to die from an injected overdose of morphine! Thus the productive and the ‘wasteful’ ramifications of the hypodermic syringe were implicit at the very moment of its invention! However, instinct and intuition shifts our focus to what are considered as the ‘positive’ elements of existence. If we can accept anything in life, we should also accept our ‘natural’ instincts and ‘spontaneous’ intuitions. Spiritual experiences consolidate our intuitive perspective for a growth in consciousness. All elements that are considered to be opposite to the growth of consciousness have a RIGHT TO RECUR till an optimal point for their transcendence is reached. The ‘right to recur’ and the ‘need for transcendence’ are equally important. A 18- months old infant goes on repeatedly asking the same question because his sensory perception of different things need to be consolidated. (Otherwise he would confuse an apple with a tomato). At a certain point, he has to transcend that level for a higher-level consolidation of his growing cognitive grasp. If for any reason his mental growth is hampered, he will remain stuck up at that level and will be labeled as ‘mentally challenged’. Suppose his mental growth has not been organically or structurally hampered; his IQ is normal, but he has not outgrown the habit of indulging in recurrent thoughts of the same kind. This then can become the genesis of what in later life can be labeled as ‘obsessive’ thinking which also needs to be transcended. Imagine the amount of ‘waste’ of the quality of life that happens to an otherwise intelligent subject who has been labeled as to be suffering from obsessive-compulsive neurosis. b) There are many elements that constitute ‘waste’ to our usual perception but in the cosmic design, they can serve a purpose and meaning. Thus it was a colossal waste of ‘intelligence’ and ‘judgment’ to crucify Jesus. But the consequences of that act humanized Europe, uplifted ‘love’ to glorious heights and made ‘forgiveness’ a virtue. c)	A significant portion of the occurrences we label as ‘waste’ is also a result of the resistance offered by the most obscure, gross, inert and inconscient aspect of existence to the higher forces of transformation and transmutation. In individual life, this ‘conflict’ can result in ill health and disease. In terrestrial existence, this clash also results in natural catastrophes. When a number of people were electrocuted to death in a ceremony in France (it was a time when electricity had started to be popular), the funeral service hinted collective sin as a cause. Musing on this incident after a long time, The Mother hinted that instead of oversimplifying the problem in terms of sin, it was more judicious to view it as a clash of forces. Interestingly, in a casual conversation recorded by A.B.Purani in the Evening Talks (Pg 524, Recorded on 15th August, 1925), Sri Aurobindo had commented that the heralding of the new age would be marked by an increase in psychiatric problems and an increase in natural calamities like earthquakes (This is exactly what is happening now). One must however be extremely judicious to draw conclusions in haste. Sri Aurobindo is not hinting that earthquakes occur due to human follies but speaks of clashes between cosmic forces. The Scientist would analyze this clash in terms of matter-energy. The mystic analyses this clash between forces that arise at different planes of consciousness. 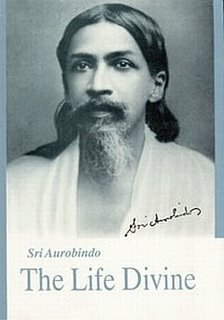 Sri Aurobindo explains in a letter written on April 10th.1934: Earthquakes are a perturbation in Nature due to some pressure of forces; frequency of earthquakes may coincide with a violence of upheavals in human life but the upheavals of earth and human life are both results of a general clash or pressure of forces, one is not the cause of the other. The clash between the lower and higher forces has been symbolized in all religions and traditions in the conflict between the Satanic and Divine forces. Sri Aurobindo gives a new twist to the clash. He is not interested in a mere victory of the higher forces. His interest lies in the transformation of the lower, disruptive, disharmonious forces in the image of the higher, synthetic and harmonious forces. His Integral Yoga is an attempt to activate the forces of transmutation and transformation. It is only then what we label as ‘waste’ can find its rightful place in the cosmic scheme. And the Titan kings assail. I have walked in the bottomless pit….